All that is necessary to cause and sustain mold growth is an adequate moisture source, dead organic matter to breakdown, and comfortable temperatures. Unfortunately, mold is most comfortable in the same temperatures humans prefer, and all that cellulose-based building materials (wood, wallpaper, drywall, etc.) would make a delicious feast for mold. All that is missing is moisture. If you suspect mold development in your Bordentown, NJ home or business, it is the consequence of an unwanted water source. You need to contact a certified mold professional to properly address the mold contamination and the water source immediately to avoid further damage. Mold is a bio-contaminate that should be addressed by a trained and certified mold professional. If your Bordentown, NJ home has a history of moisture concerns, that could have allowed a mold problem to develop undetected. Musty odors and unexplained stained or discoloration can be the first symptoms of a mold problem. If you think you detect signs pointing to a mold problem, contact a reputable professional to complete a mold inspection in Bordentown, NJ. 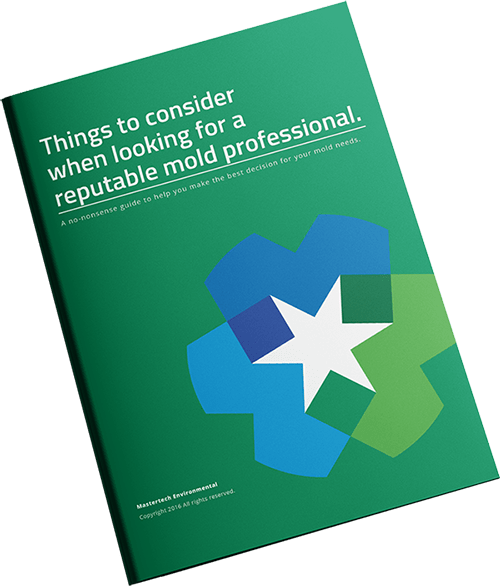 A certified professional will have the necessary training, knowledge, and tools to safely and properly assess the severity of your particular mold concerns. Mold contamination varies depending on various environmental factors and conditions. Each scope of work for mold remediation will unique to each individual mold case. After an initial assessment, your MasterTech inspector will develop a mold remediation game plan that will properly address your specific mold needs. The scope of work will outline the full process from start to finish, and it will include all recommendations for prevention in the future. While each mold remediation will be different, there are 3 key priorities that should be included in every mold remediation. Causation: Mold remediation means effective cleanup and removal AND identifying and properly addressing the moisture source that is stimulating the mold development in the first place. If the moisture is not mitigated, the mold will develop again, despite a proper cleanup. During your initial assessment, a MasterTech inspector will use moisture meters and thermal imaging cameras on the affected areas and all the surrounding areas. This will help to map the water pattern and determine where it begins and ends. In severe cases, like flooding or major leaking, MasterTech may need to complete a full Bordentown, NJ water damage restoration prior to or as part of the mold remediation. Containment: Our technicians set up containment barrier around all contaminated areas from the unaffected areas. If the mold contamination is not properly isolated, we risk cross-contamination to unaffected areas. Cleaning & Disposal: Usually, mold can be safely removed from most surfaces without the use of toxic agents. However, in more severe mold cases, contaminated building materials may be non-salvageable and will require safe removal and appropriate disposal. MasterTech technicians are trained in the most advanced techniques for the safest, most effective, and most efficient removal and disposal of moldy materials. When it comes to mold in your New Jersey home, you need a mold company that will prioritize you and your family’s safety and best interest. Call MasterTech to speak with a member of the MasterTech Team about mold inspections and mold removal in Burlington County, NJ. For mold inspection and mold removal in Beverly, NJ or mold inspection and mold removal in Cinnaminson, NJ, call 609-948-8844!